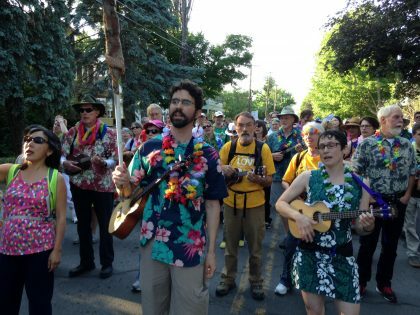 T he Unitarian Universalist Ukulele Union (UUUU) took root in 2015-16, growing to over 20 members, most of whom had never laid hands on a uke prior to joining the group. They have twin missions of having fun and building community, both within FUSIT and beyond. You can find them in the Ithaca Festival Parade, Ride for Life, PorchFest, and at a few Sunday morning services.